Of the visual variety, that is. 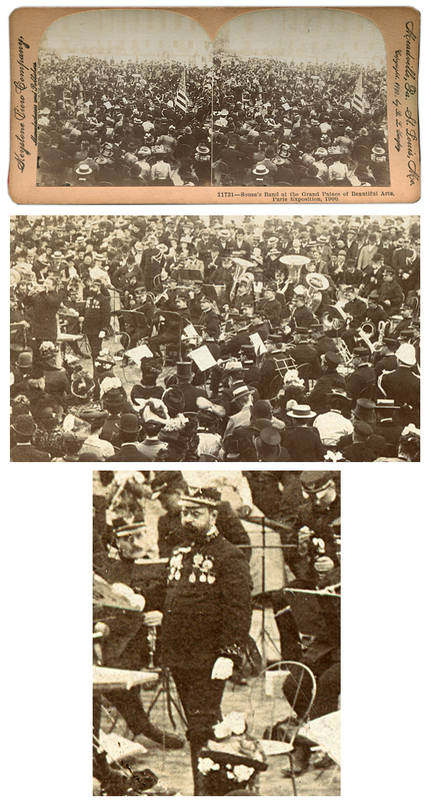 This Keystone stereoview shows Sousa and his band performing up-close-and-personal at the 1900 Paris Exposition. It appears to be a considerably smaller group than his later behemoth organization. Presumably, Arthur Pryor is down there, somewhere. The location is probably Vienna, reputedly the site of Slezak’s 1913 Pathé session. 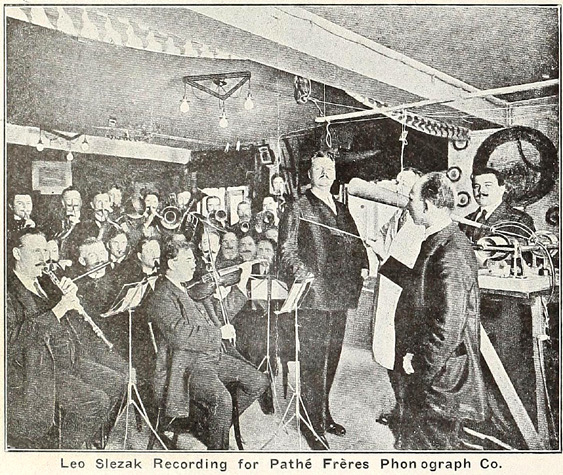 The photo was reproduced in the September 1914 Talking Machine World, just as the New York–based Pathé Frères Phonograph Company (the French company’s U.S. licensee) was preparing to unveil Pathé discs to the American public. The company had only recently begun to make its own recordings and thus had to rely heavily on imported discs, like Slezak’s, to fill the initial catalog. The oversized cylinder master, from which the disc masters would be transcribed pantographically, can be seen at the far right. This photo (along with others taken in the American studio and in various foreign locations) contradicts the popular anecdotal tale that Pathé’s recording equipment was a jealously guarded secret, hidden behind locked doors and never to be glimpsed by performers or the public. This index has been moved to its own page — Click here, or on the “Links to Other Online Articles” tab at the top of this page.